With 6 million Americans still unemployed and over 78 million approaching retirement age, there are opportunities to capture rollovers from employer-sponsored plans. 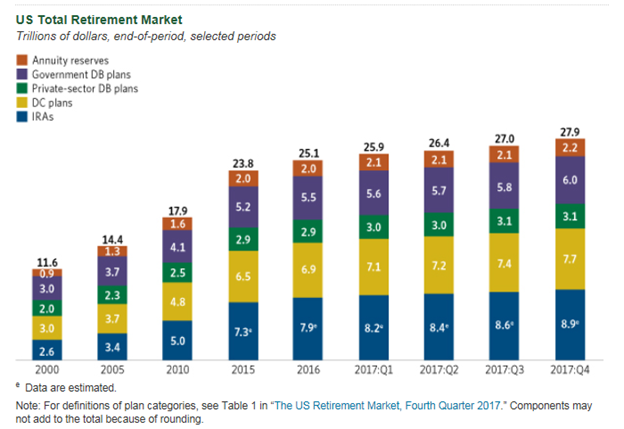 According to the Investment Company Institute, out of the 27.9 trillion dollars in retirement plans, comparatively there are 8.9 trillion dollars in Individual Retirement Arrangements (IRAs) and 7.7 trillion dollars in defined contribution plans (see graphic below). The increases of assets in IRAs are fueled by direct rollovers from employer-sponsored plans. To capture a share of the rollover market it is good to know the triggers or distributable events that allow for direct rollovers to occur. 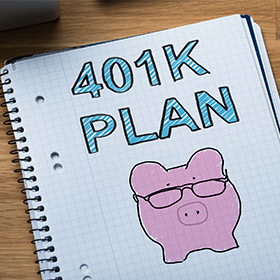 Direct rollovers from employer-sponsored plans may come from a Qualified Plan such as your 401(k) profit sharing plan, tax deferred or tax sheltered annuity (403(b)), and governmental 457(b) plan. They can ask for a distribution or request for their funds to be directly rolled over to an IRA or another employer plan if they have one. If they ask for a distribution, the amount they will receive will be typically 20% less because of the mandatory withholding mandated by tax law. Or they may rollover the funds within 60 days but in order to avoid any of the distribution from being taxed, they can make up the 20% withheld from the distribution out of pocket. The most efficient way to move the dollars as well as preserve assets from taxation is via a direct rollover. A direct rollover is a distribution from the employer plans with the distribution payable to the receiving plan thus eliminating the mandatory 20% withholding. It also keeps the assets tax deferred since the dollars go from one tax-deferred account to another tax-deferred account. Understanding direct rollovers will not only help ex-employees in keeping their hard earned retirement dollars from unintended tax consequences, but may also allow retirement professionals to capture direct rollovers. Professionals like CPAs, CFPs, Financial Advisors, banking personnel, brokerage firm representatives and other professionals need to stay educated to help their clients with questions they may have regarding their retirement. IRA Academy provides professionals with educational classes on IRAs and IRA-based employer-sponsored plans. This event is open to anyone who wants to stay competitive in the retirement field. To receive more information about the 2018 IRA Academy, or to take advantage of our early-bird pricing for our event, please visit our site. You’ll be among the first to know about the agenda, curriculum, and registration details.